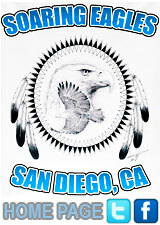 Soaring Eagles cultural dancing and regalia making classes in San Diego, California, for Native American students; active fun things for families to do to learn about local Indigenous culture in Southern California. See SOARING EAGLES WEB SITE for current information, including current class and event schedules, contact information, FAQ, registration and eagles art posters DOWNLOAD. Also see ROY COOK's SUMMER CLASSES Blog for more of his class-by-class personal notes and complete photo galleries. The Soaring Eagles Dancers performed live at Viejas Indian casino, 2/18/2009. 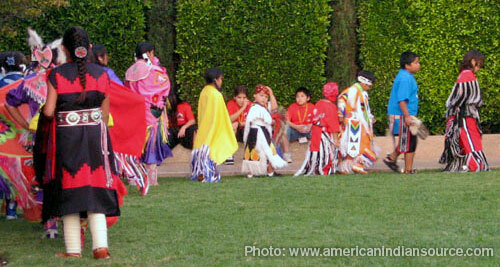 SOARING EAGLES at VIEJAS POWWOW — Young California Indian students perform live on the Viejas Indian Reservation. 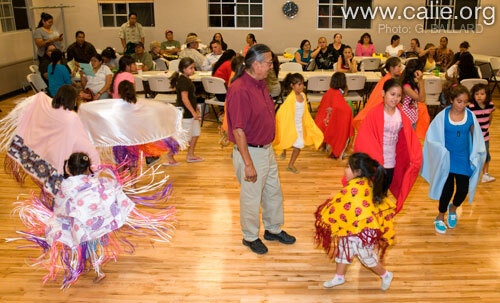 Another great turn out September 10, 2008 for the Soaring Eagle Dance and Regalia class. 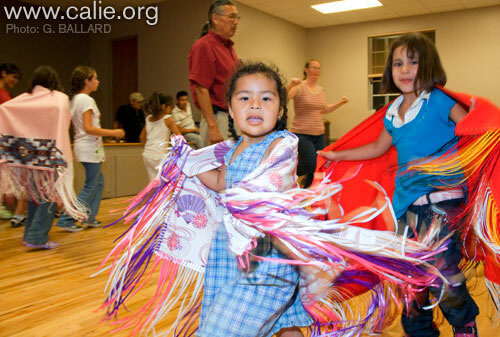 The parents have voted to keep the Wednesday night for the Soaring Eagles Dance Class. 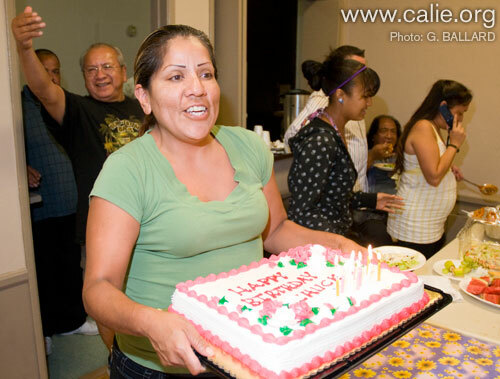 This popular and appreciated Soaring Eagle program has continued support from September 10, to November 19, 2008 by the Southern California American Indian Resource Center, Inc. (SCAIR) and the San Diego Indian Center. 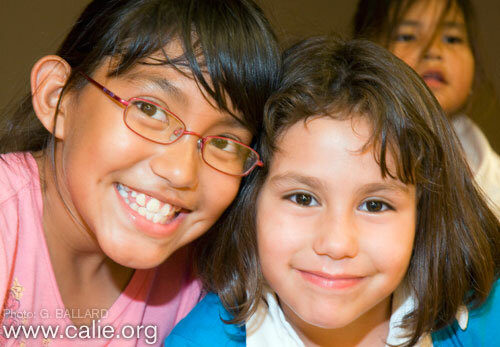 Parents and Students commitment can make the difference in this second half of the program. 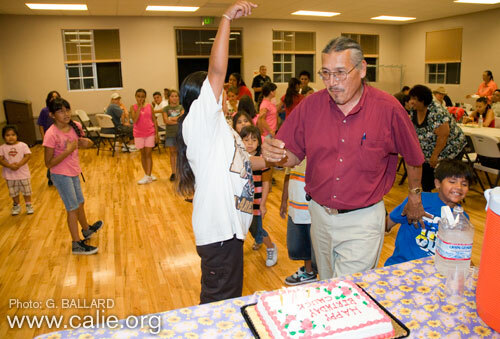 Chuck Cadotte, Lakota Indian Nation, is the Soaring Eagles lead instructor and brings a wealth of traditional teaching experience and leadership to the San Diego cultural program. Building on the summers instruction are the enthusiastic and eager instructors: Jeannette Van Dyke and Chuck Cadotte. Additionally Vickie Gambala led a talking circle of the young dancers on the protocol and proper conduct in the pow wow circle. Parents and Students will make the difference in this second half of the program. 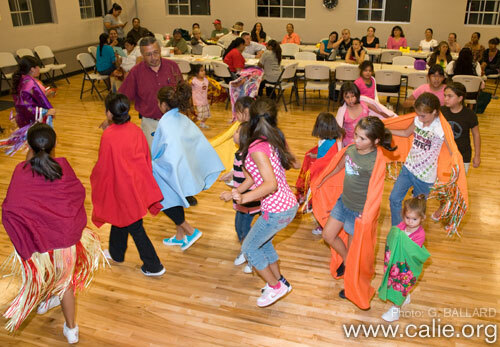 Promoting community participation within CALIE cultural network brings families together and famous Indians out to share in the tribal fun. Pictured in the hat is SCAIR Senior Advisor Randy Edmonds (Kiowa-Caddo) with his wife, Bonnie (Ojibwa). Randy Edmonds addressed the entire group with the blessing for the feast and informed us as how the traditional tribal gatherings are occasions for spirituality and sociality that now, in the urban environment, are part of the drum and the pow wow circle. He has this ability to convey sincerity and tradition in a few well-chosen words that echo voices of past wisdom and tribal ways. The San Diego Inter-Tribal Singers of San Diego welcomed some new faces to the drum: Frank Gastelum, Yaqui and Terry Hinsley brought in one of his Green River Singers, Steve Begay, Dine. Together with Ben Nance, Richard Decrane and Roy Cook the drum is powered up and sounding sweet. Instructors, parents and the dancers were responsive to the songs brought forth. It is a good night for singing. We were also happy to see the progress of the regalia that some parents brought in for Vickie to look over and advise and encourage all to get going purposefully. Sylvia Mejia is assigned from the Indian Human Resource Center to also sew and assist the success of the dancers regalia. Parents and Students need to participate actively to make a difference in this second half of the program. Vera Tucker, Kumeyaay Indian woman from Viejas Indian Reservation, teaches a young Indian student how to grip her fancy shawl. 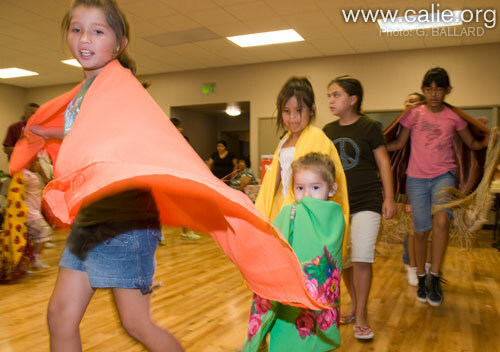 The young Native American school girls learn how to position their bodies, step and swing their arms to exhibit fluid artistic motion into their fancy shawls. We were also pleased to see new visitors to the second half of the Soaring Eagles Dance class: Vera Tucker, Kumeyaay and Tina Morales, Cree were there and brought in a young dancer or two to join our happy group. All are welcome to attend these free for the community classes. 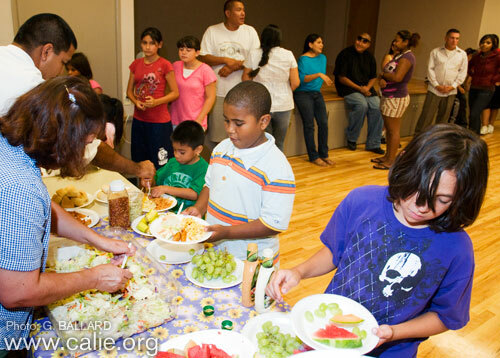 You never know what's going to be on the menu with our Indian community pot luck events, but everyone gets a full belly. Finally, there is some good eats at the feast prepared by Debbie Razo again: Spaghetti with meat sauce, tossed salad, piles of fresh cut fruit and grapes. Ice tea and good hot coffee. Chuck is called up for his 42nd birthday party. Additionally Vickie brought in a store-bought birthday cake to acknowledge Chuck Codotte’s birthday. The singing was wild! 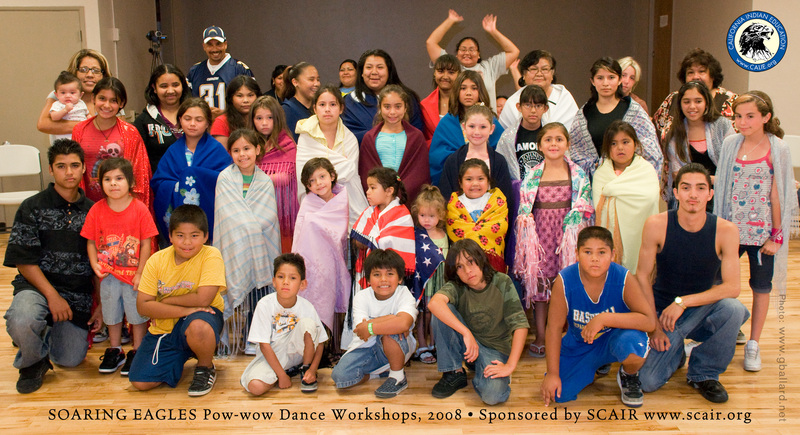 We will look for you all on Wednesday night 6 to 8:30 pm from September 10, to November 19, 2008 at the Soaring Eagles Dance Class, Normal Heights Community Center, 4649 Hawley Blvd. San Diego, CA. 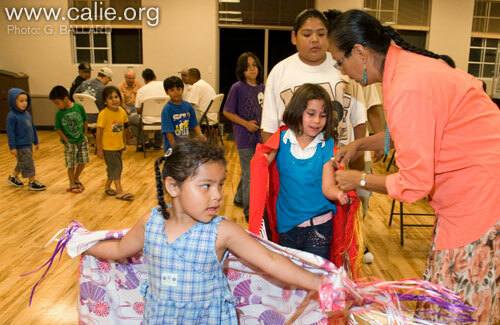 Tina Morales, a pow-wow Jingle Dancer, and her sister, Lita, volunteered to help teach the children. Sheilah Dasher, Diné, and two of her young Native American colleagues addressed the Soaring Eagles group about upcoming projects they are working on. Sheilah, a recent graduate of Southwestern College, won the first place 2006 journalism award in the category of Multi-Cultural Story or Series for a student film, "Faces of Immigration," she produced with Southwestern College Sun. BLOG by Roy Cook, Opata-Oodham, Mazopiye Wishasha: Writer, Singer, Speaker. The Soaring Eagles were invited to be a part of the Sunday evening entertainment at the San Diego Native Youth Wellness Conference, 'Its Your Life, Live It Safe'. There were lots of good workshops, tons of snacks and very good eats! Most were pleased with the event and appreciated the opportunity for our Indian children to dance in front of the public before the November Veterans Pow wow. 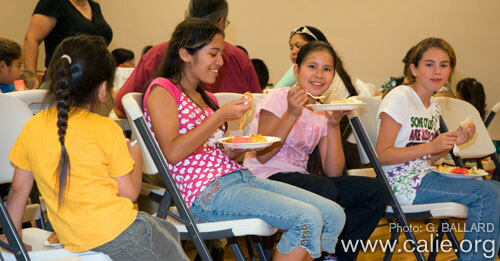 Parents' active involvement will make the difference in this second half of the Soaring Eagle dance program. Our friend, Randy Edmonds is called upon to address the entire group with the blessing for the feast. He informed us as how the traditional tribal gatherings are occasions for spirituality and sociability. Also, that now, in the urban environment, those public gatherings are part of the drum and the pow wow circle. He has this ability to convey sincerity and tradition in a few well-chosen words that echo voices of past wisdom and tribal ways. Vickie Gambala still needs to see the continued progress of the regalia. Some parents brought in the outfits for her to look over, advise and encourage all to get going purposefully (three weeks!). We had three more sewing machines: Latisha Price, Eileen George, and Sylvia Mejia. They were there this evening if any parent needed help with the sewing. Parents and Students need to participate actively to make a difference in this second half of the program. 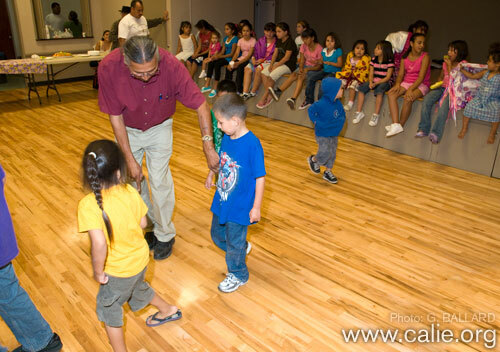 We are pleased to see new visitors to the second half of the Soaring Eagles Dance class: Phillip Himel was a fancy dance instructor for the Title VII program in the 1970's. He goes up from the drum and kicked up a few of his moves on the dance floor. Not bad for a fellow who is 51 and still pow wow happy. 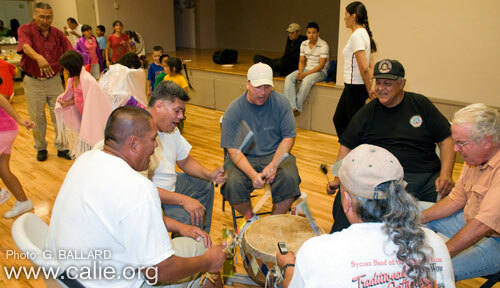 Also, the American Indian Warriors and their families came in after their monthly meeting. All are welcome to attend these, free for the community, dance classes. Finally, there are some good eats at the feast prepared by Debbie Razo again: Homemade potato salad, fried chicken, corn chips and pretzels, cookies along with iced tea and punch was just perfect on this Indian summer night. Hot and humid just like back home when we used to go outside after supper and enjoy the coolness of the evening. 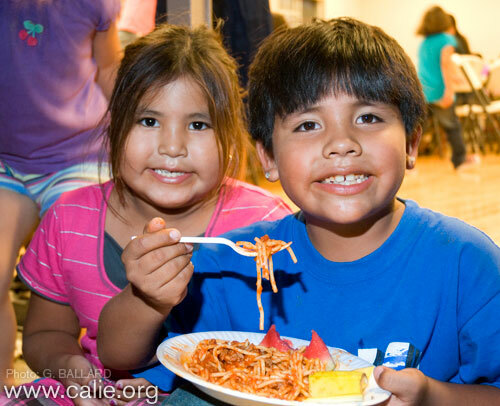 The well attended and appreciated Soaring Eagle program has continued support from the Southern California American Indian Resource Center, Inc. (SCAIR) and the San Diego Indian Center. We will look for you all on Wednesday night 6 to 8:30 pm from September 10, to November 19, 2008 at the Soaring Eagles Dance Class, Normal Heights Community Center, 4649 Hawley Blvd. San Diego, CA. At the Wednesday October 22, 2008 evening session there is a wonderful excitement and enthusiasm in this Santa Ana evening. There is also a great turnout of children and community members, volunteers and observers. 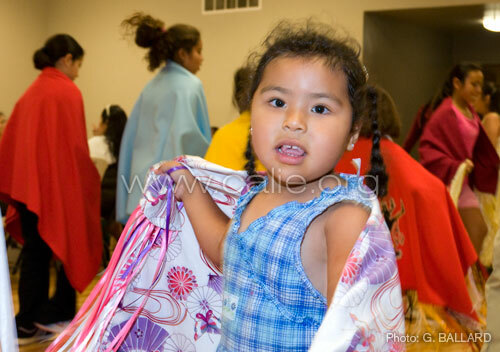 We are touching the life of each child that is attending the Soaring Eagles Dance and Regalia classes. 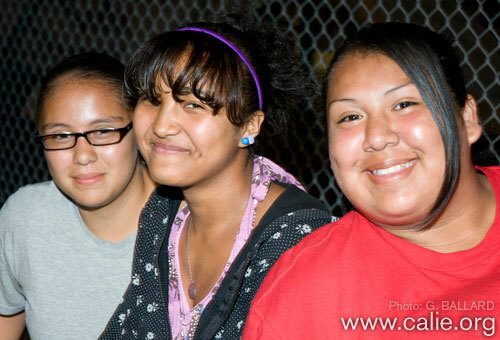 We had a good time singing at the Soaring Eagles practices held at the Normal Heights Community Center located at 4649 Hawley Blvd. San Diego CA 619-281-5964 Wednesday October 29, 2008. A fine time for Indian humor, conversation, frantic activity on regalia, regional comfort food and some great songs for flying feet and swirling shawls. From sign in sheets to speeches and the final sweep up. Smiles powered the efforts of all to help the Indian students learn and still have a good time. New faces of Indian families are in the room. Some other families were not able to attend due to sports and other commitments. But there is something good here to keep folks coming back week after week. You just have to be here to see it in the faces of the Indian children and the proud smiles of the parents. 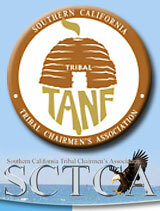 The San Diego Inter-Tribal Singers of San Diego. 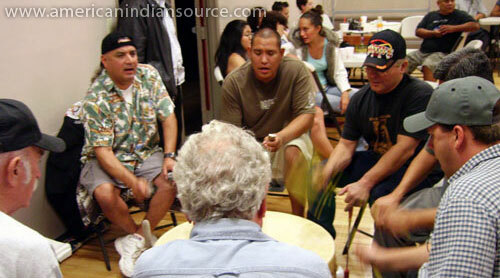 For now foremost in every ones mind is the upcoming Veterans pow wow at the Viejas Band of Kumeyaay Indians Recreation Center on November 8 & 9, 2008. The Soaring Eagle students will be brought into the pow wow circle at this event. Debbie and the rest of the Razos brought in wonderfully smelling and warm belly filling chilaquillas. Fresh fruit and other delightful goodies had folks going back for seconds. Plenty of punch and water to cool down the hot dancing and the coffee hit the spot for the rest of us this cool evening. The classes, fun, songs are free to the public but it is a community POT LUCK so bring something good for others to share next week. Also see ROY COOK's SUMMER CLASSES Blog for more of his class-by-class personal notes and complete photo gallery. See SOARING EAGLES WEB SITE for current information, including new class schedule, registration and art poster DOWNLOAD. 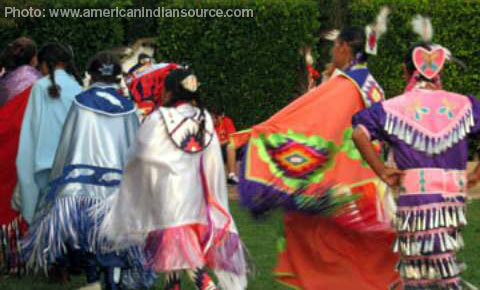 See CALIE's Pow-wow History and Information article for more info and professional photographs portfolios and movies about Native American powwows in Southern California, San Diego County.